In this episode, I talk to Jon Christiansen, the head brewer from Lucette Brewing Company. We discuss the Lucette Brewing Company Winter Homebrew Competition and the awesome support Lucette has given to the local homebrewing competition. 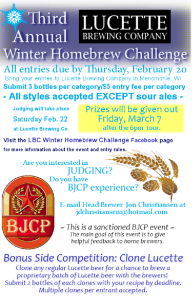 This competition is an official BJCP-Sanctioned event, so all beers will be judged according to BJCP guidelines. Lucette Brewing will be attending the Fond du Lac Brewfest on February 1, 2014. Stop by their booth to try some great beers and talk to Jon in person! 1. Any home brewer may enter the competition. All entries must be brewed on non-commercial brewing equipment. 2. Beer entries must be entered into a BJCP style. All beer styles are accepted EXCEPT all sour ales. . Meads and Braggots are also accepted. All beers/meads will be judged using the BJCP guidelines, and judged by those familiar with the BJCP program. 3. Each participant may enter 1 beer into each category. Each participant may enter up to 6 different beers or meads. The names of all the brewers should be provided with your entries. You must be of legal age to participate. The more information you provide of your bottle ID the better it will be for the judges to evaluate your entry. Provide all the information you can. 5. Entries can be dropped off at Lucette Brewing Co. at 910 Hudson Rd, Menomonie, WI 54751. Ideal times are Monday through Friday from 9am-4pm or during growler fill days (Wednesday 5pm-7pm) or tour (1st Friday and 3rd Saturday of the month). You may mail entries to Lucette Brewing Company, 910 Hudson Rd, Menomonie, WI 54751. Reminder – It’s cold in February in Wisconsin. Dropping off is best but if you have to mail, pack your bottles well with insulation, and I’ll always e-mail/call you back to confirm your package arrived well and still in liquid form. You may also call ahead at 715.233.2055 if you need drop off your entries at a specific date/time. 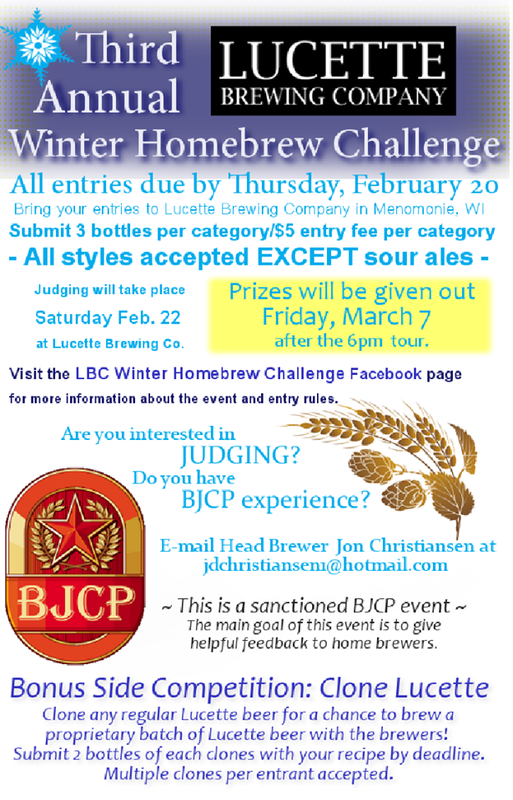 If you are interested in judging, and have BJCP experience, please e-mail the Head Brewer, Jon Christiansen at jdchristiansen1@hotmail.com for more details. This is a sanctioned BJCP event, and the main goal of this event is to give good, helpful feedback to home brewers. As the event gets closer we will announce more about prizes. Please refer to www.bjcp.org to access all the information you need regarding style guidelines and competitions.